HT-100 is an orally available small molecule drug candidate being developed to reduce fibrosis and inflammation and to promote healthy muscle fiber regeneration in DMD patients. The application of HT-100 to DMD and other fibrotic diseases is based on pioneering work by Dr. Mark Pines at the Volcani Institute in Israel. We have been granted orphan designation for DMD in both the U.S. and EU. Dosing and new patient enrollment in the phase 1b/2a clinical program have been suspended. For more information on the current status of the trial, please visit this link, email us at trialinfo@akashirx.com, or visit www.clinicaltrials.gov. To view links to relevant publications please visit this page: Relevant Publications. DT-200 is an oral SARM (selective androgen receptor modulator) with positive phase 1 clinical data that has broad potential for multiple neuromuscular diseases. The next step in development is to assess the effects of DT-200 in increasing muscle mass, strength and motor function in healthy volunteers. Successful outcomes in this clinical trial will lead to further development in DMD or other neuromuscular disorders. AT-300 is a modified form of a peptide discovered in the venom of the Chilean Rose Tarantula that addresses calcium level imbalance in muscle, an early trigger of critical pathologies in DMD muscle that lead to loss of function. It is the only known specific inhibitor of the stretch-activated class of calcium ion channels. Originally discovered by researchers at the State University of New York at Buffalo, AT-300 (previously known as GsMTx-4) has been shown to positively affect cellular calcium homeostasis in preclinical DMD model studies. It is a patented new molecular entity that has been granted Orphan drug designation by the U.S. Food and Drug Administration. Click here to learn more about this molecule. 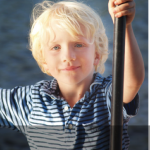 Gus Gus was diagnosed with Duchenne in 2009, when he was four years old. Now a seven-year old boy, Gus is eagerly soaking up every minute of being a second-grader. He loves music, dancing, swimming, and animals, and when he grows up, he wants to be a wildlife ecologist. Our team at Akashi hopes one day our research will enable him to do some of his own. Gus: Animal enthusiast. Music lover. Second-grade clown. Budding wildlife ecologist.